Are you looking for a wonderful and comfortable place to drink a cup of coffee or have a friendly chat with your pal? Come and try the best pastries at Casa Cappuccino, one of the most popular downtown cafes in Barrie. Knowing what Casa Cappuccino has to offer, the locals gravitate to this eatery to have a delicious breakfast or lunch – as well as a surge of energy and positive thoughts for the rest of the day. If you have never been to Casa Cappuccino, upon arriving here you will find a small coffee bar, offering a wide selection of cold drinks and mouthwatering snacks served by helpful staff. 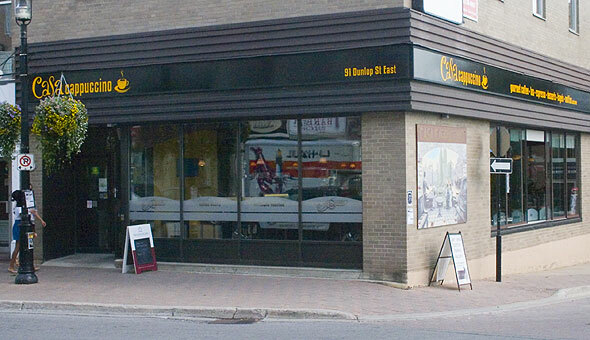 The venue boasts a perfect location in Barrie’s downtown area. Often dubbed as a hidden gem that deserves more recognition, Casa Cappuccino is nicely decorated and atmospheric, perfectly fitting for any occasion. A lot of guests rank the café high due to its top-class sandwiches and cinnamon or vanilla-flavoured coffee. When great coffees are served from clean machines, isn’t it the essential need for a coffee-bean gourmand? On top of that, the staff are congenial and friendly, ready to go the extra mile for every client. The service is quick, and the prices are reasonable. These are two of the reasons why regular visitors frequent this place. The place is always busy, and students and young employees often use it as a coworking or study area. However, there are occasional reports of the washroom not being clean enough or bad attitude on the part of the staff. Perhaps the café cannot compete with titans like Starbucks in some aspects, but having an excellent espresso here is a kind of ritual that many people can hardly abandon. Casa Cappuccino does not only serve dishes and drinks. It is an important hub, a place where interesting people gather for an interesting event. Such is, for instance, a traditional jazz festival that unites fans of mesmerising music and offers an assortment of great jazz compositions. Apart from that, Casa Cappuccino always stands for healthy food products and thought-provoking social campaigns. Those who have a passion for art will always contemplate modern artworks in oil and acrylic paints, charcoal and pencil on the walls of this café. For budding amateurs in art, master classes are held regularly. Casa Cappuccino is a nice and cosy coffee house overlooking the Millennium Place park and having a great view of the waterfront. Sitting near the window, one can get a great view of the neighbourhood, and for cold winter days, there is a fireplace. This coffee house is recommended to anyone planning a break in their busy daily routine or having a spare hour in Barrie and not knowing where to hang out. Visit Casa Cappuccino with your friends, and this will be a memorable evening out in the heart of Barrie. Read a full review of Casa Cappuccino here.